Katie will show you how to maximise the longer layout to its full potential with her handy tutorial using the SANTORO®'s Willow collection. These A4 layouts look great framed as art for your home. 1. For this project, I have die cut two cogs from the Santoro’s Willow cogs die set with card to create a stencil for your paper. I have then placed them on the middle of the Santoro Willow Cog paper and spritzed them with black mister. Remove the cogs once they are dry. 2. With the distressed pink striped paper, cut one strip of paper to 8cm x 1.5cm and another to 10.5cm x 2.4cm and on each paper cut a fishtail design on one side. 3. Cut the brown damask paper to 8.5cm x 2.6cm and diagonally cut one corner off to create a ribbon effect. Cut another piece of paper to 12.5cm x 2.6cm, again cut the diagonally cut the corner off. 4. With the brown damask paper, I have then cut the border out to 1.5cm x 12cm strip. With the pearlescent green floral paper, I have die cut the a large tag from the First Edition Tag die set and the border die from the Belle and Boo Die set. 5. Following the scrapbooking layout sketch, place the die cut paper and strips of paper accordingly. Stick the papers down once you are happy with the layout. 6. I have then die cut the largest nesting stamp with the brown polka dot paper and then stuck a cropped 4” x 4” photo to the centre of the die cut paper. Layer the die cut paper on the top right of the A4 paper using foam squares. 7. Die cut four large cogs and two small cogs and spritz them with black mister. Stick two large cogs and one small cog to the top left of the image. Add the one large and small cog to the bottom right of the image and tuck the final cog under the nesting stamp die to give the scrapbook layout further dimension. 8. 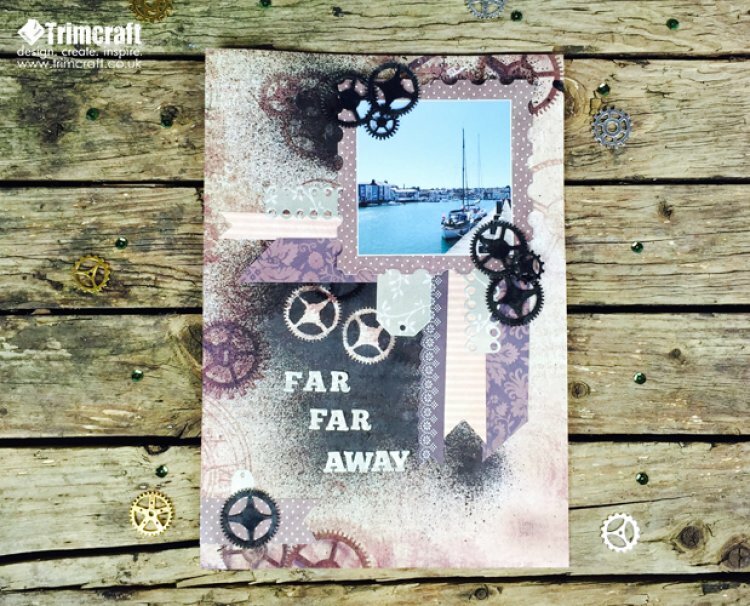 With the pearlescent green floral paper I have then die cut the title ‘Far Far Away’ with the First Edition Alphabet Die Set and I have them added them under the cog stencil with each word under each other with an increased indecent. 9. To balance the bottom of the A4 layout, I have die cut the smallest tag from the First Edition tag die set with the pearlescent green paper and a large cog. Spritz the cog with black mister. Whilst drying, I then have cut the brown polka dot paper to 6.8cm x 2.5cm and cut a fishtail design out of one side. Place the fishtail design to the bottom right of the page, leaving a 1.3cm space allowance below it. Tuck the small tag towards the top left and layer the cog on top of the patterned paper before sticking all the papers down. Have you been inspired by Katie’s How to Scrapbook tutorials? We would love to see your scrapbooking layouts in the project gallery.